Are you looking to do something truly magical? 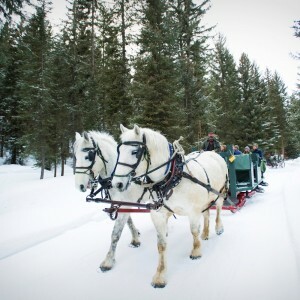 Why not book a sleigh ride dinner in Big Sky, Montana? It’s an authentic Western experience that the whole family will enjoy. What could be more fun than climbing into a trusty sleigh and letting real horse power pull you through a winter wonderland? 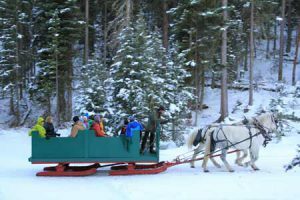 As you snuggle up in a warm blanket with your family and friends, a team of horses transports you along snow covered trails through pristine Montana forests. Your destination is a campsite, yurt, or cabin in a pristine natural setting where you’ll enjoy a delicious meal that may include prime rib, salmon, cobbler, soup, and other tasty foods that will make your tastebuds smile. Whether you go when the air is full of snowflakes or you book on an evening where the sky is twinkling with stars, a sleigh ride dinner in Big Sky is the perfect non-skiing activity. Several different businesses provide sleigh ride dinners in Big Sky, Montana. Who will you book your adventure with? 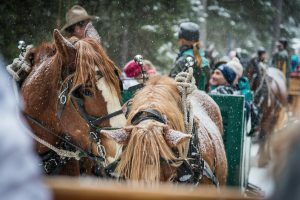 Visit the above websites for more information including menus, schedules, photos, and other important details about sleigh rides in Big Sky. There may even be lodging packages that you can take advantage of! Whether you’re a private party, a fun-loving family, or a couple on a romantic weekend, a sleigh ride in Big Sky is something that you’ll remember for a long time. If you’re booking a sleigh ride dinner in Big Sky, be sure to dress warm and bring your camera. The typical season runs from mid-December to late March or early April and is dependent on snow. Always make a reservation to ensure you and your crew have a spot. Sleigh rides are a popular activity that gets booked quickly - especially during the busy seasons. If you’re looking for a different type of dinner adventure (or you're not a fan of horses), check out the Montana Dinner Yurt - instead of the horse drawn sleigh experience, you’ll ride in snowcats to a yurt tucked into the forest below Lone Mountain. The Montana Dinner Yurt serves a delicious dinner and is home to one of the best sledding hills around.